Pumpkin raisin biscuits make the perfect light breakfast or snack. They’re extra light and fluffy due to the carbonated water that they are baked with! *This post is sponsored by Sodastream. While I was compensated and provided product for my review, all opinions are my own and not influenced in any way. Food science is super cool. I’ve been an avid watcher of Alton Brown’s “Good Eats” for years, loving all his quirky explanations of the science, history and technique behind cooking our favorite foods. I like to explore different methods of cooking and baking, and I enjoy stepping outside my comfort zone in the kitchen. If I screw up, no big deal, it’s all about learning what works and what fails and that’s what makes us all more well-rounded home chefs. When I received the new SodaStream Play, I couldn’t wait to use it for non-traditional purposes. Honestly, I don’t drink classic soda pop, but I do love sparkling water and drink it often. I knew that it would be fun to use to make unconventional bubbly drinks and to use in my baking experiments. How do you use carbonated water in baked goods like pumpkin raisin biscuits? Here is where it gets pretty cool and interesting, well, at least to food nerds like me. The carbon dioxide in the sparking water gives lift to the dough, making it lighter. The bubbles create pockets of air that expand under heat, yielding an airy texture in the finished product. It also lowers the pH of the dough, making it more acidic, slowing the yeast’s leavening action and yielding a more tender dough. It’s important that the water is really cold, since increasing temperatures affect the ability of a liquid to hold gas. When you work with dough made with sparkling water, you need to work quickly and make sure you don’t over work it. Pumpkin raisin biscuits made with sparkling water from the SodaStream Play are delicious and the biscuits recipe is a keeper! Remember not to play with the dough too much. I know it’s tempting, but just knead it enough to combine, then gently roll it out to cut your biscuits. You can leave out the pumpkin and raisins and do all yogurt or sour cream. They will turn out delicious either way! These pumpkin raisin biscuits have a very subtle pumpkin flavor and are wonderful eaten alone or with your favorite biscuit toppings. They are amazing with apple butter or pumpkin butter this time of year! Have fun playing in the kitchen and don’t forget to check out the Sodastream Play! Making your own carbonated water is a big cost savings if you purchase sparkling water. Just think of how many fun cocktails you can make with it, too! You can even personalize it with these cool skins. They offer a great line of naturally sweetened products and the MyWater flavor essence drops, which I used in the bonus, Cherry Orange Spritz, recipe below. 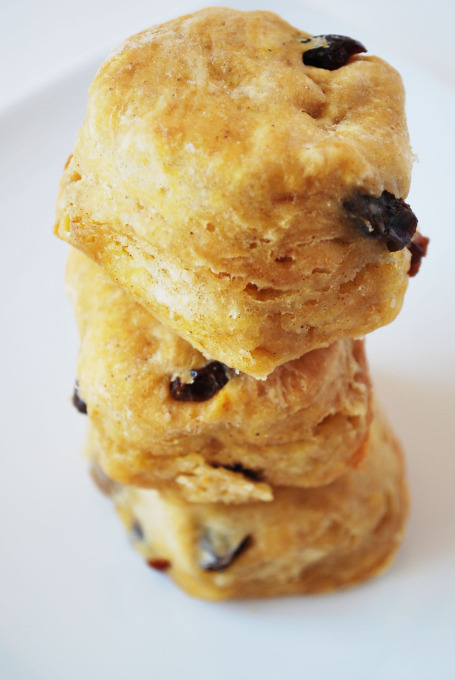 After you make the pumpkin raisin biscuits, please let me know what you think of the recipe! To go with the pumpkin raisin biscuits, I created a natural fruit soda recipe, using my new Sodastream. It is a great alternative to syrup sweetened beverages. My daughter gave it a, kid-approved, two thumbs up! Blend all liquids together, add ice and garnish with fresh orange slices. Enjoy. Soda doesn’t have to be unhealthy when you can make your own, clean-diet, recipes with the Sodastream Play! Looks Delicious. Thanks for sharing this. I get more information from it. I want to try this at my home.